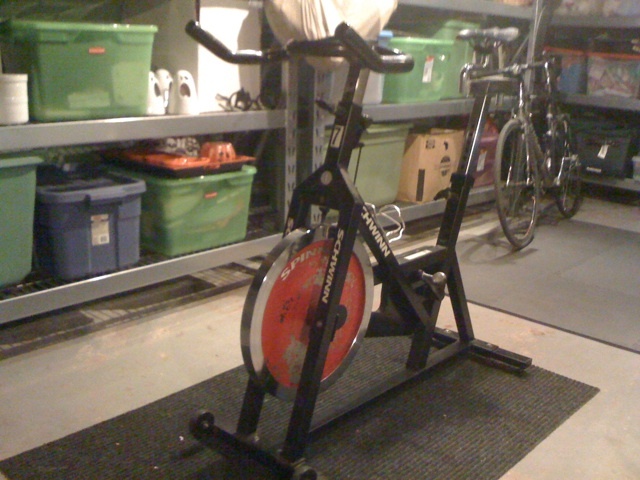 Got a crazy, crazy deal last night on a Schwinn Spinner. Found it on Craigslist; a guy was using it as a coat rack and wanted it gone. CHEAP. Happy to oblige. It was numbered ‘7’ from whatever gym it came from. The Lance karma is strong with this one. Spinning on the trainer is alright, but spin bikes, if you can dial the fit in, I think are fantastic. They’re fixed gear, which keeps you from getting lazy. They also weigh a ton and are unbelievably stable. I can absolutely thrash on the pedals without remorse. I carried the measurements over from my road bike and was able to fit the Spinner extremely close. Using my own saddle and pedals, it’s more or less a 110 pound version of my race bike. Time to BUILD HUGE QUADS.